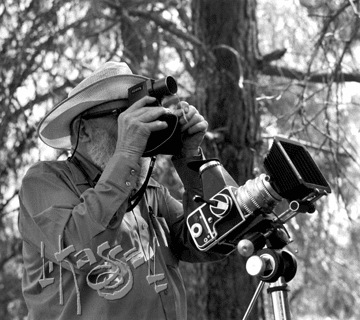 Ansel Adams at work, Bear Valley, California, May 1971. It was mid-week in May, 1971, at Ansel Adams’ six-day Yosemite Workshop. The photographers in attendance ranged from young and excitable (like me) through seasoned seniors with (apparently) loads of money, time, quality cameras and confidence. Early Wednesday Mr. Adams announced he was leading a photo expedition from Yosemite National Park to Bear Valley, California, and would any one care to ride along with him. I was first to volunteer, then spent several hours “riding shotgun” for Mr. Adams in his Ford LTD listening to stories of photographic zones, his extensive travels and Edward Weston. I was a curious young man and listened intently — amazed and amused at the revelation that MAD was his favorite magazine. We passed the Mariposa County Courthouse and other sites Ansel Adams had recorded over the years. At several locations in Bear Valley, he’d plant his tripod, focus a top-quality Hasselblad camera, measure highlights and shadows with his Pentax one-degree spot meter, evaluate the scene through a yellow gelatin filter, then take his single exposure. All the while I was bracketing exposures with my second-hand Mamiya C330 twin lens reflex camera. I developed the (long discontinued) Kodak Panatomic-X black-and-white film the following morning and had some pretty decent negatives as a result — including a couple shots of the Master Photographer himself. Welcome to my glob, Volume 1, Number 1. There could be erors. I was told to write from what I know, and I know something about art, but certainly not everything I should about the subject. And that’s why I’m counting on feedback from friendly friends and (constructively) critical critics. As a painter I favor realism with maybe a touch of humor — from others as well as myself. I believe we should paint to the best of our ability each time, and then build on that to become better — eventually achieving artist stature. Is randomly smearing paint on a canvas declaring: “It came from in here” (pointing to the heart area) the best use of God-given talent and resources? I was not blessed into a wealthy family, nor folks that encouraged my art, nor did I have the talent to earn an art scholarship. What I learned was gleaned from art history books and studying the techniques of the Old Masters. When I graduated from North Salem (Ore.) High School, I enlisted in the U.S. Air Force and was sent to electronics school where my classmates were already ham radio operators and already knew the color codes on resistors. That I knew the primary and secondary color wheel was of no consequence. In the little time off I had, I’d paint oil portraits of classmates’ girlfriends from a tiny photograph http://larrykassell.com/about . I learned the tough lesson that if it did not look like their love interest, or better, I didn’t get paid. In the mix of subjects I painted portraits of a captain and a major. The Air Force then decided I’d make a better Illustrator than Missile Maintenance Technician, so I painted fighter jets in acrylics and prepared informational slide shows for the remainder of my commitment which concluded in South Korea. At the Base Exchange at Osan, Korea, cameras were duty-free and I had access to a darkroom, so I retired my paintbrushes for a time and pursued my new found interest in photography. I admired the crisp landscape work of Ansel Adams, struck up a postal correspondence with him, and in 1966 purchased one of his noted photos — Aspens, New Mexico. After four years of military service, I worked for the State of Oregon Education Division as a Graphic Artist, the (Salem) Statesman-Journal newspaper advertising department as an ad designer, the Silverton Appeal-Tribune newspaper as Advertising Manager, State of Oregon Employment, again as a Graphic Designer, and a now defunct graphics firm in Salem before launching my own design, commercial photography, publication design, and humorous illustration studio in 1976. We pretty much have to do-it-all to stay in business in a town the size of Silverton, Oregon. 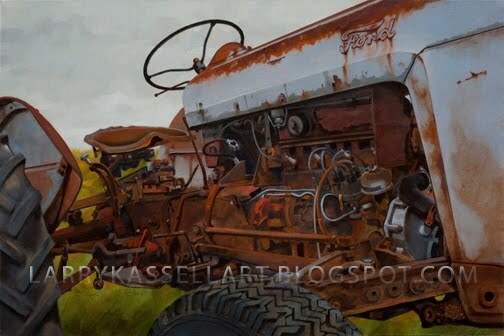 April 2011 marks my 35th year as Kassell Concepts. I photograph, write, then design ads, brochures and booklets. I enjoy humorous illustration (cartooning), because humor and caricatures often best drive home a point. Photography is especially rewarding because a photographer has to actually be present at the event to capture a photo, and sometimes that requires extensive travel. In forty-plus years of photography I’ve met so many interesting people and witnessed so many gorgeous sunsets that I can’t keep it inside. A photo in an album, attic, or still in a camera or computer is like the tree that falls in the forest and nobody hears. So, I choose to share my illustrations and photos — but like home movies, they’d better be interesting. I published two photo books of my hometown, Silverton Sampler (1972) and Silverton Sampler II (2003). As much as I love photography, film and darkrooms have gone the way of tail fins on cars (remember 1957? ), and digital photography and its editing programs have made practically everyone a photographer. In December, 2007 I bought some canvases, an easel, a few brushes and a selection of Gamblin oils and launched my third or fourth career. Now with our six kids out of the nest, and with my wife Julia’s blessing, I paint, paint, paint — whenever I find time — like when I was in the service more than forty years ago. Seriously. The best artist in history was Norman Rockwell. The best impressionist was Bernie Fuchs. My favorite living artist: James C. Christensen. Others, living and not-so-much, are Adolphe William Bougerau, Nelson Shanks, Jacob Collins ... all traditionalists. The best artist in Silverton, Ore. is probably the lady who decorates cakes at Roth’s Fresh Markets. This painting is from a photograph taken many years ago of a friend posing with my wife Julia’s VW Beetle, Susie. 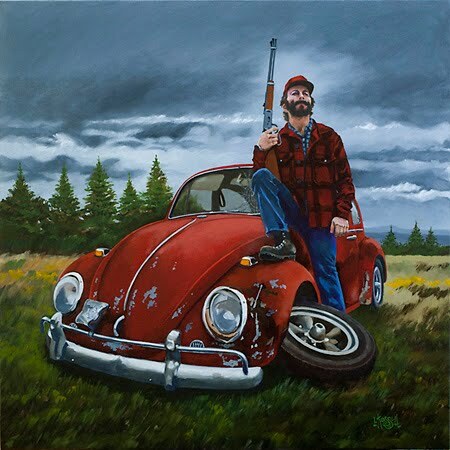 “The Controlled Beetle Hunt of 1968” takes a humorous poke at Oregon’s SUV and pickup owners who see little foreign nuisances on the road as fair game. A brush-and-ink rendering of this painting will be featured in an upcoming book I’m working on. I’ll keep you updated. I was born several years ago in Michigan to humble parents. My father was a printer and my mother a homemaker who could do wonderful things with cabbage. I had no intention of following my father’s footsteps, so I got involved in the arts. After high school I enlisted in the U.S. Air Force where they thought I’d be a great missile technician. In my free time I’d paint portraits of other guys’ girlfriends. The Air Force reassessed my interests and made me an Illustrator. I finished my tour of duty in South Korea where I bought my first camera and hung up my brushes to follow the crisp landscape photography of Ansel Adams. 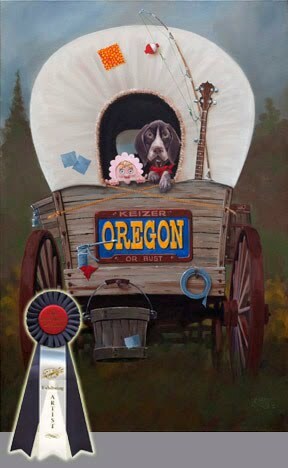 I’ve worked for the State of Oregon twice as a Graphic Artist, two newspapers in advertising, and a couple of design firms before launching Kassell Concepts, a graphic design and commercial photography studio in 1976. I enjoy cartooning because humor often drives home a point. I still enjoy photography because it’s taken me places I’d never have seen. Then in December 2007 I bought some canvases, a few brushes and some oil paints. Now with my wife Julia’s blessing, I paint, paint, paint — in my very limited time. A not-so-well known moment in American history was when my mother demanded: "Don't just sit there like a bump-on-a-log." I found a stub of a pencil in the couch cushions and started a career. Six decades later I sit like a bump-on-a-log in front of an easel watching oil paint dry. Here is some fairly-fresh produce. Raggedy Ann dolls like these remain perennial favorites among gift givers, receivers and collectors. Softer and more cuddly than the latest electronic device, these dolls need no batteries nor programming, and are durable enough to be passed from generation-to-generation along with the memories. Often stowed in a special trunk or cubby, these adorable friends welcome the opportunity to be held and hugged ... and shared with others. 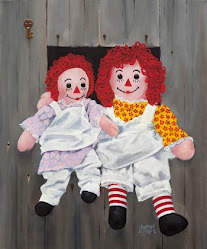 We all have a Raggedy Ann memory tucked into that cozy cubby in our mind. Revisit that special place today. Original oil painting 24 x 20 in. In the mid-20th century most young men emulated their Saturday matinee idols (yes that's me in the pix). 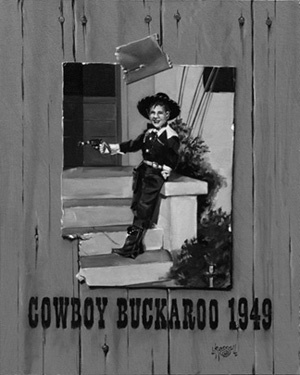 That was until I discovered a painter earns so much more than a movie star cowboy. Oregon is a state of campers and contractors. 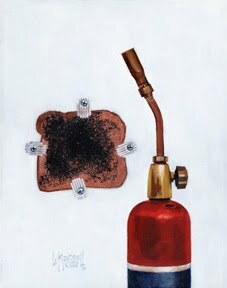 Would you expect a simple thing like toast prepared any other way? This 14" h x 11" w painting is available in original oil and giclée. 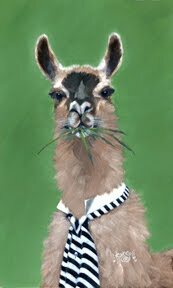 Llamas are known to spit and belch, but when pressed by their date, can act all grown-up on Prom Night. 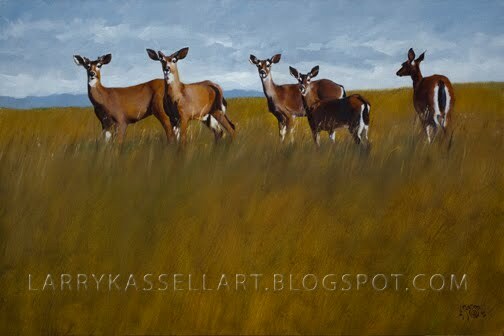 Oil on canvas, 20" h x 12" w.
© Copyright 2009/2015 Larry Kassell. Simple theme. Powered by Blogger.